William Faulkner? Peter De Vries? Herman Wouk? Somerset Maugham? Jane Yolen? Raymond Chandler? Anonymous? I have seen these words attributed to the satiric New Yorker writer Peter De Vries, the Nobelist William Faulkner, and playwright-novelist Somerset Maugham. Who do you think originated this quip? This Wouk profile was reprinted in several newspapers including the “Des Moines Register” in Iowa 2 and the “Springfield Union” in Massachusetts. 3 Faulkner died in 1962, four years before the story was published, and QI has not yet located any direct support for the attribution. Someone once asked Mr. Faulkner if he wrote by inspiration or habit and he said he wrote by inspiration, but luckily inspiration arrived at 9 every morning. I know what that means. And there is a kind of magic about keeping the stride once you’ve got it going. Frank Lloyd Wright? William Faulkner? The Elder Gross? Charles Seiberling? Charles Douville Coburn? Anonymous? But a man shouldn’t fool with booze until he’s fifty; then he’s a damnfool if he doesn’t. Are these quotations accurate? Is it possible that one of these individuals heard it from the other? Perhaps this saying predates Wright and Faulkner. Could you explore this topic? 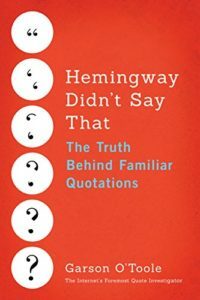 Quote Investigator: The quotations ascribed to Frank Lloyd Wright and William Faulkner are well-founded and detailed citations for them are given further below. Do you think that singing boys take great delight in music? Satiety makes it rather tedious to them. He who drinks before he is thirty, can take no great pleasure in drinking. The best judges of the proper use or abuse of alcohol are medical men, who carefully note causes and effect. I would rather have personally observed facts than whole tomes of theories. In youth alcohol is of no benefit: it is harmful. In the aged it is a blessing, if used properly. Some one has said, “A man is a fool who drinks before he is fifty, and a blank fool who does not do so moderately thereafter.” Whiskey should be taken by the aged when overcome with fatigue and before taking food, as a tired man has a tired stomach; and a small portion of the stimulant will lift up the vitality and make good digestion possible. Raymond Chandler? James M. Cain? Alan Moore? William S. Burroughs? Larry Niven? Stephen King? Elmore Leonard? William Faulkner? Owen Sheers? They haven’t done anything to my books. They’re still right there on the shelf. They’re fine. Is this story accurate? Who were the participants?